Last night at our men's event, MAFIA, we had the privilege of hearing from Rob McCully. Rob and his family were featured on Extreme Home Makeover last October. I won't go in to all that his family has been through the past several years but here is the Reader's Digest version. His son, Job (as in the guy in the Bible), was diagnosed with leukemia at the age of 4. He has since been through tons of junk including a bone marrow transplant, lung transplant, and his heart stopping for about eight minutes one time. Job is now doing "as well as he's done in a long time" according to Rob. He is in a wheel chair and has diabetes to go along with his other difficulties. There are two obvious questions (well, three if you include "Why did you name your kid 'Job'?"). The other two are "Why has God allowed all of this to happen to this family?" and "How in the world do you deal with all of this?" The name question was answered in his talk. You should have been there. The "Why" question is still being answered and might be handled in another post sometime. The "How" question is the one I want to talk about. Rob said about a hundred times in his talk that he and his family have had to "lean on God" through all of this. They have had to "trust in God" through it all. While those things may have different meanings to each of us, this is the statement he made that really stuck with me. In talking about giving this to God and trusting God to handle it, he kept saying, "What other option is there? What other choice do we have but to give it to God and trust Him?" What other option is there? What a huge statement of faith (even though I know it's a question). The fact is this. When it all comes down, there really is no other viable option to handling the junk in your life than to trust God to handle it for you. To trust Him to help you get through it. Yes, it is true that you can try on your own and you can put your faith and trust in people. But those things will fail you. You run out of strength on your own and people, even the most well meaning, will let you down at some point. God won't. So What? When you are faced with junk in your life, go ahead and take the most reliable option and trust God to handle it for you. Trust Him to walk through it with you. Trust Him to give you all you need to make it through. If you really stop and think about it, what other option is there? A few of the many comments from our first Saturday of Hitting the Towne, a day of showing God's love in practical ways. We had crews washing windshields at gas stations, handing out water at Wal-Mart, helping people with their packages and buggies in parking lots, and a team who visited Nursing Home. "I made a new friend. We told each other 'I love you'", a boy who visited a Nursing Home referring to the man he met there. "I actually prayed with her!" - A guy who was washing windshields at a gas station referring to a lady he met who was having a tough day. "Will you pray with us too?" - A family in a car at a gas station who witnessed our crew washing the windshield of the car in front of them and praying with the occupants of that car. Both of these families were on their way to hospitals in Little Rock to visit with sick family members. "What's the catch?" - the frequenly asked question to those who gave away water. The correct answer? "We're just showing God's love today. Have a bottle of water." "When can we go back?" - asked by the children of a family who visited the Nursing Home. "It was cool! I got a hug!" - a fourth grade boy referring to his buggy helping experience. So What? Showing God's love by serving others is not an event but a lifestyle. My prayer is that we all develop the habit of serving others everyday, no strings attached, just showing God's love. Want to have some fun and show God's love at the same time? Join us each month for Hitting the Towne. The next one is Saturday, February 14. We meet at the building at 10 and we are done at noon. Emailme for more info. What an amazing Birthday Celebration! 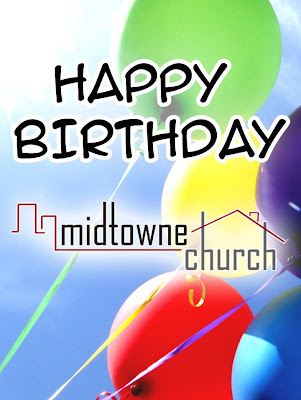 Midtowne celebrated its first year this past Sunday and it was truly amazing as we set a new record attendance of over 600! Here are a few highlights in case you missed it. As we looked back over the past year, it was beyond awesome to see how God has worked. What started with 33 people in a meeting at a golf course club house has now turned into a church averaging 460 a week. We have witnessed incredible growth in our Children's Ministry and in our Student Ministry. We added a second Sunday morning service in November. We have grown from 8 Neighborhood Groups to 15 and have added ministries to Women and Men. And in just the past three months 80 people have been taught how to have their own personal time alone with God. But here is the best part of all. In just one year we have seen 87 people give their life to Jesus and identify with Him through Baptism! It is simply amazing when you really stop and think about it. I have cried many tears of joy as I humbly recall all God has done. There have been some really funny times, really sad times, and some really outstanding times. We have seen God show up in some major ways and meet our every need as only He can. So What? We can't settle in our past. We must Prepare for the Future. God has done amazing things but we believe that greater things are yet to come and greater things are still to be done. We will always give God the glory and will always seek His direction and ask for His favor as we continue to Help People Find and Experience God's Best for Their Life. One down, only God knows how many more. What an amazing adventure! Check out the Birthday Video that we showed in our services.